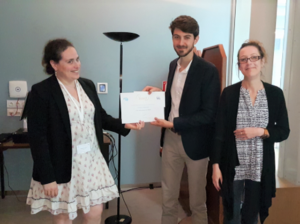 6 thesis prizes have been attributed to young researchers during the event “Journée des Jeunes Talents de la Chimie en Ile-de-France“, organised on 4th June 2018 by the Ile-de-France office of the Société Chimique de France/French Society of Chemistry (SCF), in order to reward the excellence of their work. Olivier Dalstein, who was a PhD Student from 2014 to 2017 at the Laboratoire de Chimie de la Matière Condensée de Paris – LCMCP (CNRS/Sorbonne Université/Collège de France) and at the Centre de Nanosciences et de Nanotechnologies / Centre for Nanoscience and Nanotechnology – C2N (CNRS/Univ. Paris-Sud) with Andrea Cattoni, was rewarded with the industrial prize, sponsored by the company Ynsect. The aim of his thesis, entitled « Nanoporous thin films structured by Top-Down & Bottom-Up approaches: towards smartphone-compatible optical sensors », was to apply micro/nano-fabrication techniques (Soft Nanoimprint Lithography, Crack-Patterning…) to original nanoporous materials (MOF, sol-gel) in order to fabricate photonic sensors used for the detection of atmospheric pollutants like VOC. The optical responses of the fabricated structures (e.g. diffraction gratings) were measured directly with a CCD from a camera or a smartphone. This work led to 4 publications and an international patent. Learn more on the “Journée des Jeunes Talents de la Chimie en Île-de-France” event website.